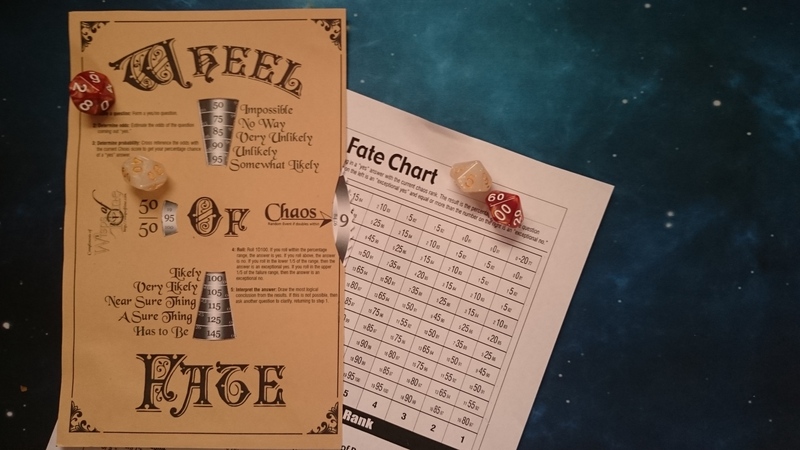 The Wheel of Fate is a volvelle representation of the Mythic: Game Master Emulator’s “Fate Chart”. A volvelle is also known by other names: wheel chart, “dial-o-matic”, info chart, dial chart, calculator, and more. While the term originally referred to such tools created for astronomy (and became rather popular in the Middle Ages up through the twentieth century), volvelle seems to be the universal term for them now. You’ll find them employed for everything from baseball stats to oil filter selectors. 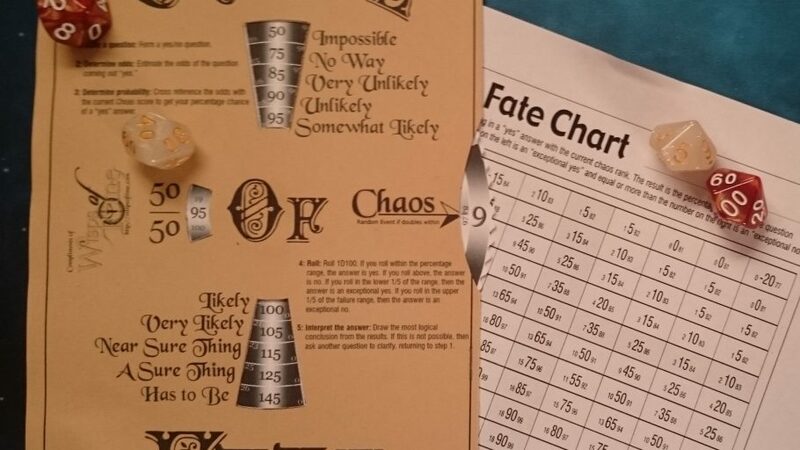 To use the Wheel of Fate, one simply turns the “dial” to indicate the current Chaos Rank, and then you may quickly reference the target Probabilities and their exceptional values for all eleven Odds exposed in the windows. It also serves as a reference for the other Mythic information you’ll need: How to Use the Fate Chart, Summary of Resolving Random Events, Event tables, and more. For some reason, when I looked at the Mythic Fate Chart, I thought it could be better arranged as a volvelle, bringing to mind the Night Sky star finder wheel I had as a kid. So, I gave it a try, and first mocked one up out of paper. I found some good information and borrowed the Hub idea from a site called Paper Chipmunk, which seems to have the only “volvelle tutorial” I could find on the entire internet. Check that page out if you have any Hub problems (and let me know if I can clarify the instructions) or if you’re interested in creating your own volvelle. Here’s how mine turned out with a natural “husk” colored Cover. It got a little wrinkly from the glue “wetness”, which is why I instead recommend an adhesive roller. This particular volvelle was created mostly for fun, but I’m calling it a tool in the hopes that you find it both fun and useful. You’ll need at least 2 pieces of card stock. White for the Wheel page will probably work best, but you could potentially use a different color for the Cover page, as long as the print remains legible. You’ll also need some scissors, perhaps a razor blade or X-acto knife for the finer cuts, and an adhesive roller or double-sided tape. Glue will work as a last resort, but beware of “wet” glues that will wrinkle up the card stock and potentially soak through and weld the Wheel to the Hub or the Cover. And lastly, don’t forget to bring your mad paper-cutting skills. Special thanks to those of you on the Lone Wolf Roleplaying G+ community who test drove the assembly process and provided feedback! The download link is below and I’ve also put it up on DriveThruRPG as a FREE product. If you have any issues with printing, assembly, usage, etc., or if you spot an error in the number, you can ping me on the Contact page, via , or comment on this post and we’ll try to troubleshoot. In general, print pages 2 and 3 at full size without any scaling to fit, etc. so everything has the proper proportions. Please Note: I would like to thank the author and publisher for allowing me to share this tool with you! 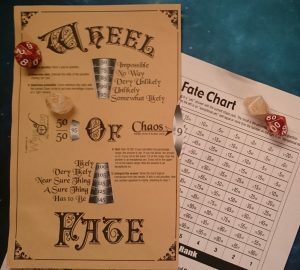 The Wheel of Fate is derived from Mythic: Game Master Emulator © Copyright Tana Pigeon and Word Mill Games. Used with permission and no challenge is intended. Thanks, and I hope you enjoy the Wheel of Fate! Download the Wheel of Fate v0.1.23 on DriveThruRPG! v0.1.23 – 2018.03.13: Corrected “exceptional yes” numbers for Chaos Rank 1, Adjusted contrast on “exceptional” numbers for Chaos Rank 8, Fixed typos, Updated instruction page.